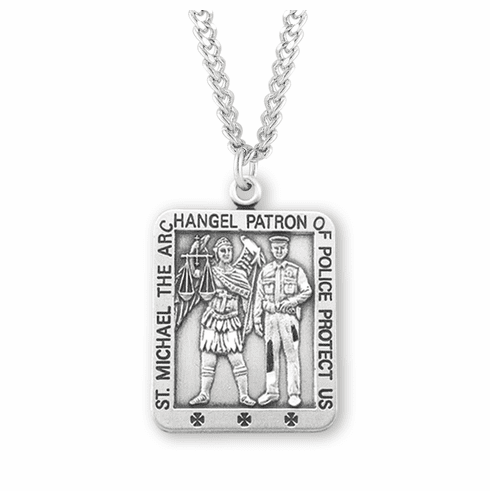 This beautiful sterling silver St. Michael medal necklace is made in the USA by HMH Religious. The Christian medal is adorned with a depiction of St. Michael slaying Lucifer. Die striking only the finest grade solid sterling silver stock, enables the intricate details of the coined precious metal to fully show when the antique finish from hand polishing is applied to each medal. It is then highlighted by hand engraving, to display the beautiful sheen of pure Sterling. A rhodium plated curb chain is included with a deluxe velour gift box. All of HMH Religious products have a limited guarantee from defects in material and workmanship.